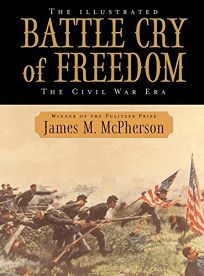 McPherson's Pulitzer Prize-winning opus is by now the standard one-volume treatment of the Civil War. Encyclopedic in scope, it synthesizes political and military history into a sweeping narrative of America's national epic, one that paints the North's victory as the triumph of a""revolutionary future"" of""competitive, egalitarian, free-labor capitalism"" over the tradition-bound and hierarchical society of the South. This new edition eliminates the footnotes and trims a fifth of the text to make way for color maps of major battles and campaigns and hundreds of photographs, cartoons and artist's depictions from the period. McPherson's accompanying captions sometimes overdo the characterological readings (in one portrait of a Confederate general we can supposedly""almost see Breckinridge's handlebar mustache twitching in anger""), but they provide interesting biographical background as well as piquant details and an indelible period feel. Serious Civil War buffs will delight in this magisterial treatment.